After winning their third series in a row, the Colorado Rockies missed an opportunity to catch a potentially sleepy Chicago Cubs team off guard, as their Monday night match-up was postponed due to rain. But as the rain washed away Monday’s series-opening affair with the Cubs. There’s no drowning out the solidified status that the Rockies have cemented in baseball. It’s time to put aside the ‘hot start’ discussion when talking about the Rockies and start talking about this team being good. Very, very good. I know Rockies fans, it’s easy to fall into the trap of believing too early. Believing that baseball in Colorado is finally hitting a stride of playoff caliber, only to be left at the altar when the summer months of June and July come around and the team is in the cellar. But this year is different. This team is different. The mindset at the top is different. This team is actually good and apparently, only the rain can stop them right now. 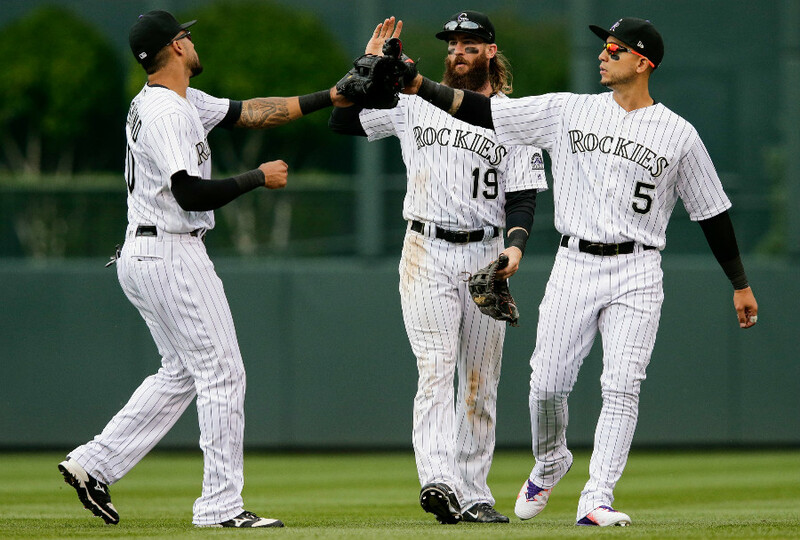 Baseball is already 20 percent through it’s season and even amidst losing starting pitcher Jon Gray to injury and Chad Bettis to cancer treatment, even with some their most reliable bats failing to fire on all cylinders, the Rockies are 20-12. Oh, and did I mention they have to do this all while grooming three pitchers under the age of 24? Yes. After all this, they’re first place in the division and currently one of only two teams at 20 wins in the National League. Offensively? They’ve roughed up talented opposing pitchers like Johnny Cueto, Madison Bumgarner and Clayton Kershaw. They’ve found power from the least likely places in Gerardo Parra and Mark Reynolds. This team is inside the top 10 of most offensive categories, even with Trevor Story and Carlos Gonzalez both batting under .200. Can you imagine the offensive output when those bats wake up? When all cylinders are firing at once? It’s a scary thought that this team hasn’t hit full-stride on offense, yet still scores runs at will. Now offense has never been the question. But pitching is another story. Can a rotation and bullpen in Colorado dominate hitters and hold leads? The clear answer this year is yes. Colorado’s success is coming without Jon Gray. Their bonafide ace from 2016 has missed multiple starts due to injury, but while other ball clubs would usually struggle without their No. 1 starter. The Rockies have found a strong backbone in their young up-and-coming arms. Grooming young pitchers can be very difficult and demand immediate patience, however the Rockies found the magic elixir for Antonio Senzatela and Kyle Freeland, who have come firing out of the gate and are a combined 7-2, both sporting ERA’s below 3.00. Pitching well beyond their years, they’re surprising the MLB world. But let’s talk about the bullpen. Colorado’s crutch. Their achilles-heel of 2016. You could describe it with every single possible cliche last year. This is not the same bullpen. It’s been revamped, rebuilt and it’s not only good. It’s great. Two key additions are making their presence felt immediately. Closer Greg Holland leads the league in saves and is a perfect, 13/13. A key addition in left-handed reliever Mike Dunn has solidified the Colorado bullpen. Once a major weakness from last year, is now a direct strength. The Rockies are holding and winning one-run games, holding a 9-0 record in one-run games in 2017, as opposed to 12-20 in that same statistic in 2016. They are the only undefeated team in the majors in one-run games. Quality pitching and timely hitting. This team is a legitimate playoff contender and they deserve your attention. They’ve plugged the biggest weaknesses that has plagued them from a year ago and they’re led by a loose, comforting and commanding manager in Bud Black. He’s pulled all the right levers for this team and has the ball club moving forward with confidence. Colorado is 16-8 in the division and winning the games they should, a sign of a good ball club. The Rockies are here to play, playing well and getting healthy. High-prized free agent Ian Desmond‘s return one week ago certainly brought a lift to the Rockies line-up, that is still missing the contribution of OF David Dahl, who remains out with a rib injury. Commanding pitching. Great leadership. Power hitting. A lights-out bullpen. It’s the formula that’s worked for Colorado so far and there’s no evidence that says they’re stopping anytime soon…so as long as the rain stays away.